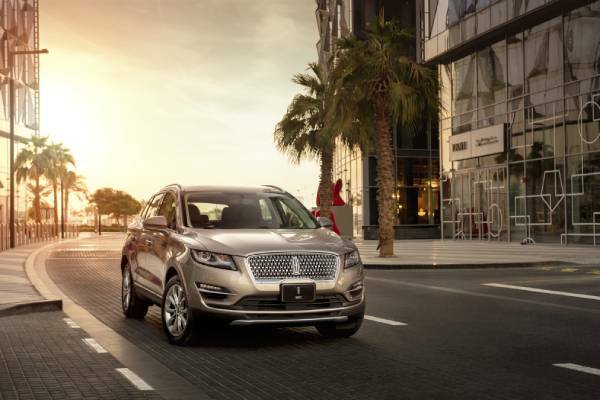 The 2019 Lincoln MKC is just like that stylish friend who knows exactly what you need, when you need it. A Lincoln MKC offers elevated function and flair to reflect the human driving it – and their friends and family members in the passenger seats. The iconic Lincoln grille serves as a point of pride, sleek, elegant and bold, the new face of Lincoln is guaranteed to make heads turn. With a chic range of colours including Baltic Sea Green to Cool Iced Mocha Metallic to bold Chroma Flame Red Premium Metallic, the fashionable options are reminiscent of the shades on SS19 runways or in the window of your favourite boutique. As the driver approaches this sanctuary away from home, they receive a warm Lincoln embrace, with LED lighting in the lower front body and tail lamps that provide a subtle, welcoming glow. Lincoln logo welcome mats, illumination in the pocket of the door handle and fadeup ambient lighting complete the experience. Once the doors are closed, the interior becomes an instant oasis. Microphones constantly monitor the sound profile inside the cabin, using a signal processor to replicate and invert any opposing acoustic waves. No matter what is happening on the roads, the MKC’s active noise control system provides calming audio insulation from the cacophony of urban life. The result is a cabin that is quiet and inviting. One touch opens the panoramic roof, filling the cabin with natural light. The stylish decor features leather and sleek wood-grain finishes, with a variety of standard and reserve trim options to choose from. The seats on Reserve models can be cooled as required in the summer months. USB ports keep everyone powered up and connected. The Lincoln MKC’s Adaptive Suspension system allows the driver to select from one of the three available modes – Normal, Sport or Comfort, tailoring responses and adjusting settings to offer the optimal ride based on their choice. Adaptive Cruise Control senses when other cars are slowing ahead, automatically reducing speed to maintain the chosen preset distance from other vehicles. Once the traffic has cleared ahead, the MKC will accelerate back up to the set speed. The 2019 MKC comes equipped with a responsive 245-horsepower turbo-charged 2.0- litre engine that uses three technologies – the boost from turbocharging, the precision of direct fuel injection and sophistication of twin independent variable camshaft timing (TiVCT) to not only make it an exhilarating ride, but a fuel-efficient one too. The new Lincoln MKC keeps the driver connected to friends and family with standard SYNC 3 that is compatible with both Apple CarPlay and Android Auto, and navigation accessible from either the touchscreen or the steering wheel. The MKC’s, voice-activated technology lets the driver safely engage while keeping their eyes on the road and hands on the wheel. Whether the soundtrack of choice is Disney classics, an inspirational podcast or Cardi B, the available Enhanced THX Certified Audio System – complete with 14 speakers – provides a rich, surround-sound experience. A confident driving companion, it doesn’t matter if the driver is cruising down the highway or backing out of a parking space, the MKC’s suite of driver-assisted technologies has their back. Plus, the pre-Collision Assist with Pedestrian Detection uses radar and camera sensors to trigger a collision warning. If the driver don’t respond, the car will apply the brakes for them. The MKC even takes the anxiety out of parking with the simple press of a button. The MKC will use its sensor array to identify a spot, then take care of the steering while the driver remains in control of the throttle and brake. The system will also help the driver out of a tight parking spot too.